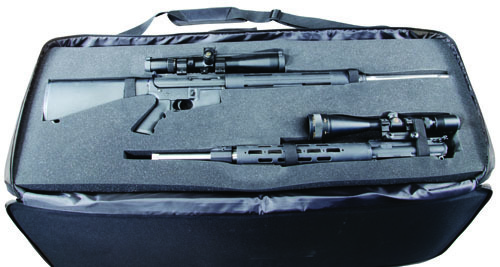 Caldwell’s® AR Transporter Case is perfect for transporting and storing your AR-15 and separate Upper Assembly. This padded case is made of Heavy Duty Ballistic Fabric for durability. It has a comfortable padded shoulder strap and wide carrying handles. The case features a large fully zippered accessories pouch and 6 Hook & Loop top magazine pouches. Caldwell’s AR Transporter Case will hold most configurations of AR-15 up to a full size AR-15 with A2 stock, scope, and 24″ barrel (over all rifle length 42″). Internal attached Hook & Loop straps hold your AR secure during transport. An additional scoped Upper Assembly can be strapped in as well.